AME execution Engine process the data. AME engine evaluate rules for that transaction types (rules are define in AME schema for a transaction type).A transaction may have more than 1 rule associated with it. AME evaluate each rule depend on the conditions/attributes. Rules then execute action Type. AME then return calling application list of approvers(Sorted based on Setup in AME). (Please note when we call AME, it generate list of approvers, Identify next approver, check the status history to check if people has already approved or Not). Calling application receive response from AME and then send Notification to Approvers. PLUS calling application update the status of the Approver in AME by means of calling a AME API ( Updatestatus API). How do u link AME and Workflow ? 1.Register your application in AME(in case it is not already register). By registration I mean Create the Transaction type/Item class/mandatory attribute etc for your Application ( if it is not already defined) in the Approval management administrator Dash board. 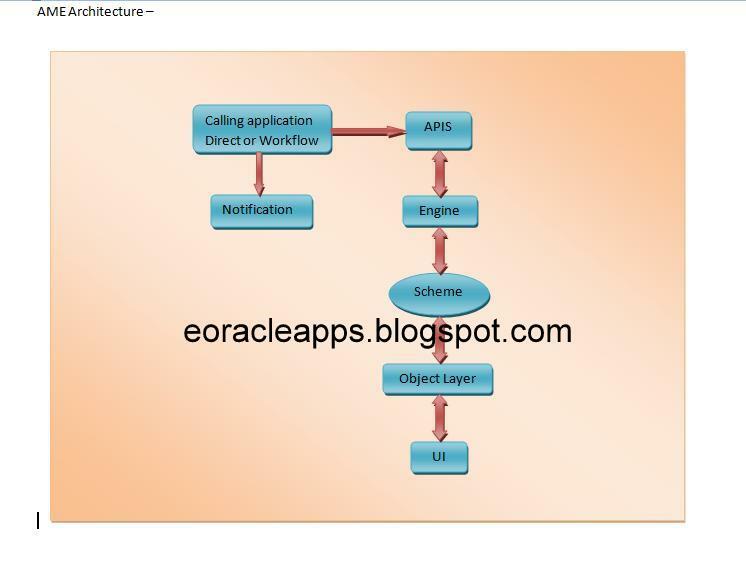 2.Once step#1 is done, call the AME API to Fetch the approver information from the Oracle workflow. Hi, Is there a way to start the ame_engine from pl/sql code through ame apis? please help.